Jeremy and I just left rainy Hoi An, Vietnam. We had previously left sunny, hot, and humid Sai Gon and had landed in central Vietnam to be greeted by winter – cold with grey skies and rain. The gloomy weather did not hold us back, however. In fact, we had the best time, cooking and eating our way through this quant old town. Centuries ago Hoi An was a major port city heavily influenced by the Chinese and Japanese. This is evident in the architecture of the buildings and in the local food fare. Cao lau, a delicious noodle dish specific to the city, incorporates these influences as well - the wide, chewy rice noodles (reminiscent of Japanese soba) are served in a rich five-spice pork broth (very Chinese), with herbs and crispy noodles (wholly Vietnamese). We found out that only one family with access to special well water can make these delicious noodles. This dish is Hoi An street food at its best. After spending the day soaking, seeing the sites, and eating the local delicacies, Jeremy and I decided to take a cooking class so that we could bring a bit of Vietnam home with us. We had an amazing chef, Tu, who works in a local four-star hotel. He has been cooking for 15 years, mastering many different cuisines, and he told us he flips over 500 omelets for foreign tourists every morning - we were in the right hands! Our menu was papaya salad, fresh spring rolls, ban xeo (rice pancakes) and a seafood hot pot. We learned new techniques and recipes and ate a delicious meal, but more importantly we met new friends. After cooking and eating we sat around, drank some beers, and talked about food. It was great - all our language barriers were broken when we talked about how to cook the best eggplant dish! Pick up a piece of pork and shrimp, add a leaf or two of mint and basil, and then use a scallion strand to tie it into a little bundle. A helpful hint: use the pointy end of a chopstick to push the end of the scallion under itself, to make a nice, tight bundle. Make as many of these bundles as your ingredients (and patience!) allow. In a small bowl combine all the ingredients and stir together until the sugar dissolves. This is an essential sauce in the Vietnamese kitchen - use it as a dressing for green papaya salad or a dipping sauce for spring rolls. It has the sweet, salty, spicy, and tart flavors that make me love Vietnamese food. I hope you enjoy this tasty fresh appetizer - I will be making it again when I get home! Your trip sounds amazing, and oh, the food sounds great! How cool to take a cooking class. I haven't seen this type of roll before and I will definitely give it a go. I haven't seen that kind of roll either....sounds yummy and easy too! Seems like you're having an awesome time...so happy for you! Sounds fantastic and Dad would really love it! Is Jeremy not shaving until back in the USA? You look wonderful. Keep enjoying your fabulous adventure. Jeremy, are you serious? You look like a lumberjack. The food looks spectacular, though. Food looks amazing. I figured you guys would love Hoi An, although it sounds much (much!) more touristy than it was 8 years ago. Have fun in the jungle. 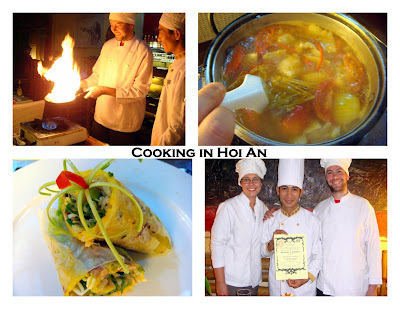 Can't wait to see what you cook in the Cu Chi tunnels! My name is Lisa, and I live in Draper, UT. My sister Sasha lives thousands of miles away in Victoria, BC. We communicate through food, sharing our stories of dishes eaten, recipes made and meals planned. We've never lived so far apart, so this blog is a way to share our passion and bridge the distance between us. Follow along and join in on the conversation! All recipes & photos are the sole property of FoodieRelations. Simple theme. Powered by Blogger.